Two years into his first term as a city councilor, Willie Bailey said he spent a lot of time debating whether to run for reelection. In his considerations, however, he said there was a deciding factor he kept returning to – it’s worth it. Although Bailey has not yet made an official announcement, he told the Times he will run for reelection in 2018. Bailey grew up in Alexandria and experienced first hand many of the issues he addresses as a councilor. He attended the Alexandria City Public Schools, lived in the city’s low income and affordable housing and grew up visiting local pools and rec centers. Bailey’s first council term began in January 2016. He said his focus over the past two years has been bringing more affordable and workforce housing to the city, ensuring schools have the facilities and tools for children to succeed and fighting for seniors so they can age in place. Public service has been a lifelong commitment for Bailey. He began his career in public service with the United States Army, retiring after 21 years. He has spent the past 26 years as an active firefighter in Fairfax County, rising in the ranks to battalion chief. 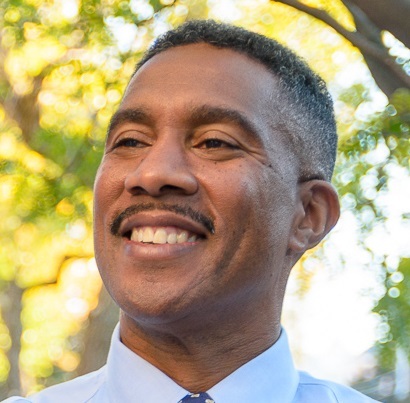 Bailey said John Niemiec, the president of his firefighter union Local 2068 in Fairfax, convinced him to run for Alexandria City Council in 2015. In 1998, Bailey founded the nonprofit Firefighters and Friends to the Rescue, an organization that provides thousands of children throughout Alexandria with coats, backpacks, toys and school supplies. Johnson has known Bailey for close to 50 years. He said Bailey’s nonprofit work demonstrated his passion for community outreach. He also said it proved he uses his platform as a public figure to serve those who need it most. “Will is the type of guy that’s fighting for everybody, not just one. He just wants … everybody to get a fair shake and a fair share. And he’s a very honorable guy. He’s a man of his word. He’s not like regular politicians,” Johnson said. Bailey said his approach to politics is very nonpolitical. John Porter, former T.C. Williams’ principal who knew Bailey as a student, echoed his thoughts. When asked to reflect on his accomplishments during his first term, Bailey said he was most proud of allocating budget money to schools, affordable housing and the summer work program. In discussing the issues, Bailey tends to reflect on his community roots. He said he fought hard on council to give funding to the summer work program because he took part in it as a teen. “To this day, I still remember my first real suit I wore was a seersucker suit. I always remember that I wore it two or three times a week to work,” Bailey said of the summer he spent doing clerical work for an engineering company. In his reelection campaign, Bailey said he wants Alexandrians to judge him for his actions, not his words.